Biography of American Classical Realist Portrait Sculptor. The American sculptor James Earle Fraser was one of the most foremost portrait sculptors of his generation. Raised in South Dakota, he was the son of a railroad engineer and saw with his own eyes the pioneer and commercial expansion westwards, and the resulting subjugation of Native Americans. Strongly influenced by this frontier experience, he was also inspired by his early work on neoclassical architectural sculpture at the Chicago World Fair. Fraser combined this classical realism with purely American subject matter to create a number of powerful images, notably: The End of the Trail (1915, National Cowboy & Western Heritage Museum, Oklahoma City) and the Indian Head coin. In addition, he sculpted a large number of famous monumental statues of US Presidents and other historical American figures. He remains one of the most popular American sculptors of his era. Fraser was born in Winona, Minnesota. His father was an engineer who worked on the railroads at a time when the network of rails was expanding across America. There Fraser encountered pioneers and befriended American natives. He often heard stories of their doomed fate and the suffering they endured as they witnessed their lands being robbed. One of the natives used to carve chalkstone into shapes, and the experience encouraged Fraser to begin his own efforts. He began carving figures from pieces of limestone, scavenging rocks from local quarries. When it became clear to his family that he was serious about becoming an artist, he was sent to Chicago to begin working as an assistant to the sculptor Richard Bock. Bock had studied at the Berlin Academy and the French Academy of Fine Arts in Paris, and was known for his sculptural decorations for architecture and military memorials. At the time Fraser started working for Bock, the Chicago World Fair was due to be held, which required a massive amount of architectural sculptures. Bock's workshop was unusually hectic, and Fraser, only 14 when he started, was no doubt given ample opportunities to learn and improve his skills. He also supplemented this by attending classes at the Art Institute of Chicago. In 1895 Bock helped Fraser to gain admission into the French Academy of Fine Arts. Although Fraser won many awards for his work at the Art Institute, his father was not supportive of his plans to continue studying as an artist. His father contacted a major railroad tycoon, Sir William Van Horn, who was a great collector of art and asked him to assess his son's potential. Van Horn encouraged Fraser's desire to continue studying, so he was allowed to travel to France. In Paris, Fraser studied under the French Sculptor Alexandre Falguiere. Falguiere was a highly acclaimed artist and sculptor who had won the Prix de Rome in 1859 and was awarded the medal of honor at the Paris Salon in 1868. While studying in Paris, Fraser was also introduced to the American sculptor Augustus Saint-Gaudens. Saint-Gaudens was one of the Beaux-Arts generation who embodied the ideals of an American Renaissance (and who would later establish an artistic colony that included notable painters, writers, sculptors and architects). Always looking for capable assistants, Saint-Gaudens hired Fraser to help him on his monument to General Sherman, which would eventually be placed at the 5th Avenue entrance to Central Park. Before returning to America, Fraser took a trip to Italy where he encountered the works of Michelangelo. He was inspired, and would go on seeking to render his bronze and plaster sculptures with the same level of emotion as the Renaissance master. 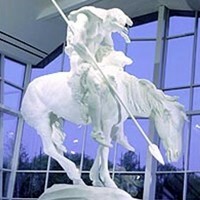 To learn how to evaluate modernist American sculptors like James Earle Fraser, see: How to Appreciate Modern Sculpture. For earlier works, please see: How to Appreciate Sculpture. In 1902 Fraser returned to America and set up his own studio in New York (the same studio he maintained for 50 years). Saint-Gaudens continued to send him commissions for plastic art, primarily for bas-reliefs portraits that he was too overbooked to do himself. Fraser also created coins for the Mint, the most famous being the Indian Head, or 'Buffalo' nickel in 1913. This coin was discontinued in 1938 but was re-minted as a commemorative coin in 2001. On one side of the coin is the profile of a Native American Indian and the other side a bison (buffalo). In 1919 Fraser also produced a Victory Medal, to commemorate the end of World War I, which was famous at the time. He also designed the Navy Cross (1917), which is awarded to Navy or Marine Corps who distinguishes themselves in action. The cross is still in use today. Fraser produced his most recognised statue - the End of the Trail - for the Panama-Pacific International Exposition held in San Francisco in 1915. It is one of the most popular sculptures in America and depicts a Native American Indian on horseback who looks exhausted at he arrives at the end of his trail. Fraser wanted to produce an image that could depict a vanishing race of warriors. The horse and rider have not only reached the end of their journey, but the end of a way of life from the American Indian. They hang their heads in exhaustion. And while the rider's arms have fallen limp, the dynamic impressionistic portrayal of the horse's mane and tail add energy to the otherwise forlorn work. Fraser originally intended to create a bronze sculpture, but material shortages due to the war prevented this. Instead he sculpted it in plaster, which unfortunately started to slowly deteriorate until the National Cowboy & Western Heritage Museum in 1968 restored it. The original plaster sculpture is on display at the entrance to museum. At the Expo in 1915, nineteen million visitors viewed his work, and he was awarded the gold medal for sculpture. Fraser was later to remark that he should have copyrighted the image, as other painters, sculptors, printers and calendar makers made much more profit from this work than he did. It remains an iconic image of American art. - Aspiration and Literature (1951, Arts of Peace, Washington DC). Fraser died in 1953. Although his style was no longer quite as fashionable towards the end of his art career, he remained popular until the end.